Christmas is the season of joy, and exchanging holiday greetings and gifts has become a quintessential part of the holiday. It is during this period that retailers may find themselves in the black despite the slow economy. One such retailer is Lush, a UK company that sells cosmetics handmade from fresh, organic fruit and vegetables, Since opening its first Singapore store in 2011, the company has been enjoying annual double-digit growth. Recently on September 1, Lush opened in Vivocity its fifth and largest Singapore store, which also serves as its flagship outlet. A Lush store is hard to miss, starting with the unmistakable fruity scent emanating through its doors. 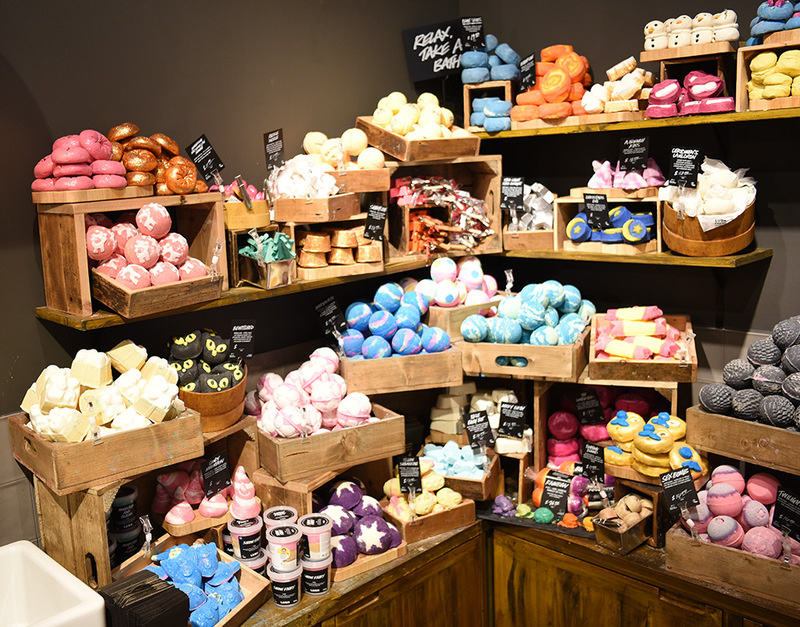 The shelves and boxes are filled with a dizzying array of products in vivid hues, including shower jellies, bath bombs, perfumes, make-up, massage bars, wash cards, facial masks and hair masks. Most Lush products have a shelf life of 14 months, with over 65 percent of the products being self-preserving. The store, which also has frequent product demonstrations, carries “a great range of men’s products” such as shaving cream. So what is Lush’s secret to success in attracting customers? Epoch Times Singapore finds out from Sohana Chowdhury, the director of Lush Singapore, on the company’s formula for success, as well as the Christmas products Lush is offering this festive season. Epoch Times (ET): Do you think that Singapore needs to reinvent the retail scene? Sohana: I think it is very important for retailers to be customer focused. We aim for every customer to experience The Wow Effect. Customer service is an integral part of everything we do at Lush. We pride ourselves in offering the most unique and interactive customer experience in the shopping mall, and customer service that is well above the beauty industry standards! Many customers tell us that our stores are a great pleasure to shop in and our staffs love creating memorable experiences for them. ET: How has Lush survived the current retail meltdown? Sohana: Lush is incredibly unique in what we offer. At Lush, our customers are not only buying fresh, handmade, effective cosmetics, but they’re also buying into what we believe in–supporting small grassroots organisations fighting for human and animal rights and for environmental protection; honesty and transparency; and moving beyond sustainability towards regeneration, to help rebuild damaged environments and communities around the world. ET: How does Lush stay ahead of competition? Sohana: Innovation and creativity in all areas of our business … we offer the highest quality, effective product–with minimal to no packaging, all with outstanding customer service! • We also donate money through Charity Pot hand and body lotion to small grassroots organisations who are working in these areas (Editor’s note: all proceeds (minus taxes) from the Charity Pot will go to charity). ET: Are there any new products or services exclusive to the VivoCity store? Sohana: VivoCity has a number of new products and concepts not yet available in any other Lush shops in Singapore. One of the most exciting is the skin consultation area that we used for more private in-depth skincare consultations and hand and arm massages. 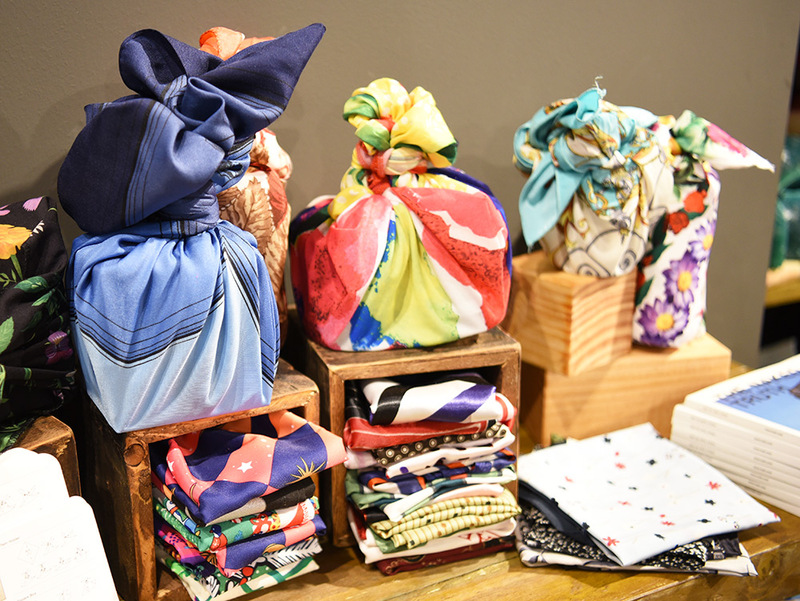 Another new concept is a Knot Wrap shelf to showcase the wonderful and revolutionary Knot Wraps, which are an eco-friendly solution to plastic packaging and gift wrap. Along with all of the current product ranges, Lush VivoCity is also currently one of the 20 shops in the world to offer customers the black label range of Gorilla Perfumes, which includes 14 liquid perfumes and two perfume oils. ET: What products do Singaporeans often buy as gifts? Sohana: We think it depends on what their family, friends, and colleagues would enjoy–to make sure they get their perfect gifts, we would ask questions to find out what their family and friends would enjoy and give them some recommendations! Bath and shower products tend to be quite popular as gifts … it is always lovely to receive products to enjoy some pamper time! ET: Tell us more about your Christmas range. Sohana: This Christmas, Lush is going back to our roots for a product launch with a difference … we’ve always championed a minimal packaging approach, but this holiday season we’re baring all and offering 80 percent off of the seasonal range completely Naked (Editor’s note: Naked refers to products that have no packaging). We always have a range of pre-wrapped gifts and this year, we have applied Naked to our pre-wrapped gifts as well, by continuing to focus on how we can use less packaging and finding more use for recycled materials in all of our packaging. Our aim is that all of our packaging has a life beyond the occasion when it was given. 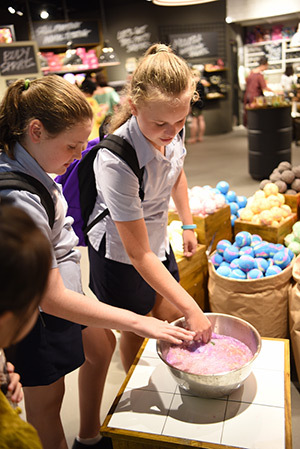 “People know us for our bath bombs, and now we have the jelly bombs,” added Sohana. For this year’s Christmas products, the Vivocity store contains a Knot-Wrap concept display for customers to choose from 16 new wraps. Knot-Wraps range from $17 to $30. If you are looking to buy the Christmas gift collection – a pre-wrapped gift that contains at least one naked product, prices range from $39 for a Little Snow Fairy gift set, to $499 for the Wow gift set that contains a whopping 40 products. Why Do These Hokkien Words Sound So Similar to Japanese?